Rinse tomatoes under cold running water and pat dry with clean paper towels. With a sharp serrated knife, slice off the top part of the tomato that was attached to the vine. Turn the tomato over and make 4 to 5 slices almost all the way down being careful not to slice all the way through the tomato. Set tomatoes aside. In a medium sized mixing bowl combine all ingredients except the tomatoes. Taste chicken salad and adjust seasoning with the kosher salt and fresh ground pepper. 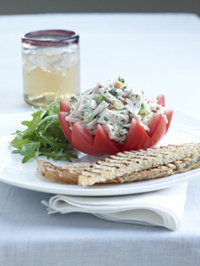 Using a fork, separate the sliced tomatoes open and fill with chicken salad. Serve chilled.